“I would say that we would all agree that we’re feeling God in a very personal way through the group,” said Anderson, 29. One of the reservations he had about abandoning traditional church life was that it wouldn’t be as fulfilling. He’s says that proved to be unfounded. Called a variety of terms including house or home church, organic church, and simple church, meetings like this are popping up across the country. Several prominent Christian authors believe they could replace traditional brick-and-mortar churches, especially if they continue to attract Christians in their 20s and 30s. Researcher and author George Barna said the house church trend shows Christians are moving away from the late 20th-century megachurch movement that made South Barrington’s Willow Creek Community Church and others like it so popular. A cultural shift is taking place, Barna argues. Some of the characteristics that made the megachurch attractive to baby boomers, such as elaborate worship performances in a concert-like venue, are what is driving away the next generation of Christians. “If you look at the boomer generation, one of the values that drives that generation is size,” Barna said. His study, published in June, is based on interviews with more than 5,000 randomly selected adults from across the country. Many children of baby boomers “see their parents gave up relationships to have money, and they see they’re missing a significant dimension of life,” he said. In response, the younger generation places a high priority on establishing and maintaining relationships with one another, Barna said. They don’t like the anonymity of a Protestant megachurch, he says. About 9 percent of U.S. adults - 20 million people - attend a house church on a weekly basis, according to Barna’s research. That number increased from just 1 percent of Americans a decade ago, and Barna predicts house church attendance will double in the coming decade. “The culture is changing so substantially and relatively rapidly that most Americans - particularly the young - don’t perceive a right way to do anything. There’s a willingness to experiment with new forms of relationships,” Barna said. That’s how it was with Padjen, who had always been a committed churchgoer until about a year ago. He was raised in an evangelical Christian home, attended a Christian college for four years and interned at Willow Creek while working on a master’s degree in church leadership. But he felt something was missing, he began to realize. Padjen and his roommate stopped going to church, and instead spent Sunday mornings praying for each other and holding intense spiritual discussions. They invited others to join them. Now the group, which meets for two hours every Sunday, has grown to six people. On a recent Sunday, each of the six, ranging in age from 29 to 46, jotted down their memories about past church group experiences, discussed their recollections and prayed for one another. 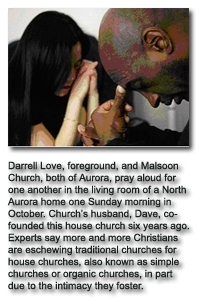 At a house church in North Aurora, the weekly gathering consists of a short Bible study followed by a discussion on prophesy, some singing, more Bible study, more singing and prayer. It resembles a traditional church service, save for the bread-maker humming on the kitchen island. Aurora resident Dave Church leads the service. Since he co-founded this group six years ago with an Aurora couple, people have come and gone. Those who have left include the co-founding couple, Jim and Judy Larson, now missionaries trying to help prostitutes in Thailand. Glenn Meisner, who hosts the church with his wife, Laurinda, echoes Padjen’s statements about the house church’s focus on relationships. Those other people include students Meisner meets as a substitute teacher at West Aurora High School and drug-addicted residents of Aurora’s Wayside Cross Ministries whom Church and Meisner meet during their monthly visits there. Many are invited to this house church. The result is a multicultural, socioeconomically diverse group of 12 people who gathered at the Meisner home one recent morning: the home-schooled 12- and 15-year-old Meisner children, Church’s Korean immigrant wife, a Wayside resident, a 16-year-old West Aurora sophomore, a 21-year-old West Aurora graduate, a Mexican couple with a baby, and an 11-year-old neighbor who is friends with the Meisners’ younger daughter. The Meisners found the idea of a home fellowship appealing after two churches they were members of moved from rented meeting spaces into expensive buildings. Megachurch leaders point to their small-group activities as a way for Christians to experience the kind of intimacy that’s characteristic of a house church. Bing Hunter, pastor of adult ministries at Rolling Meadows-based Harvest Bible Chapel, recalled a couple approaching him after a church service a few months ago and wanting him to serve as a mentor for a house church the couple planned to start. He responded by encouraging the couple to join one of the church’s small groups, gatherings of less than a dozen church members who meet weekly in a trained leader’s home primarily for in-depth discussions of the pastor’s Sunday message. The leaders of those small groups are overseen by experienced members of the church’s pastoral staff. That kind of accountability can be hard to come by in a house church, Hunter said. Steve Yarrow, adult ministries pastor at St. Charles Township-based Christ Community Church, said institutional churches have other benefits that can’t be replicated in a house church. That includes participation in rituals and large weekly gatherings, both of which can be very powerful spiritual experiences. A larger church body also has the resources to help more people. In June more than 1,300 congregation members participated in the church’s third annual Great Day of Serving, where they volunteered at the Boys and Girls Club, undertook home improvement projects, and otherwise helped out Fox Valley communities at 51 project sites. Yarrow acknowledges that both the institutional church and the house church have important roles to play.